Applications are now being accepted for the Summer 2019 Environmental Award, for those students graduating at the July 2019 ceremonies. Applications close 09:00 07 June 2019. 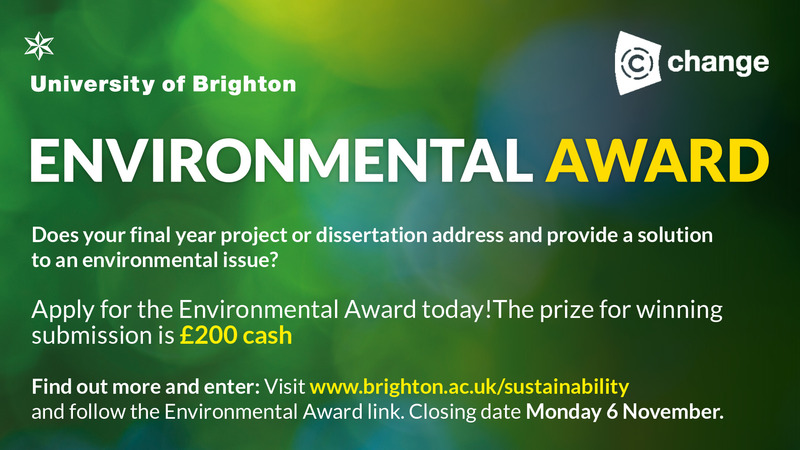 The Environmental Award aims to highlight student work being done across the University of Brighton with an environmental theme, and award students who have completed a final year project or dissertation which addresses and provides a solution to an environmental issue. The Award is supported by the University of Brighton Environment Team in cooperation with the School of Environment and Technology, the School of Pharmacy and Biomolecular Sciences, the School of Art Design and Media, the School of Health Sciences, the School of Computing, Engineering and Mathematics, Brighton Business School, the Centre for Learning and Teaching and the Green Growth Platform, representatives from which sit on the Award panel. The Award is presented twice in the academic year, at the Summer and Winter graduation ceremonies. The criteria for the Environmental Award are not strictly related to academic excellence and the Award seeks to recognise bright and innovative ideas that show consideration of an environmental issue and provide a solution. There is a £200 cash prize for the winner and they will also be presented with a certificate at their Graduation ceremony. Find out more about previous award winners here. There are two opportunities to apply for the award during the academic year, to coincide with students finishing their degrees and graduating in July/August or February. The award is open to all students who have completed a final year project/ dissertation/ thesis as part of their degree and are graduating in summer 2019. Students who have completed a piece of work as a group are also welcome to apply and the prize money would be split between the group upon winning. Projects can be from all academic areas of the university including and may include (but are not limited to) novel scientific or engineering solutions, new business paradigms, suggested societal interventions and behaviour change projects. Submissions can be made by the student themselves or by their supervisor at any point before the deadline. If the submission is made by the supervisor, up to date contact details of the student must be provided. The Environmental Award is not an academic award. Therefore the award panel will not be looking for academic excellence but will focus on how the work addresses and investigates an environmental issue and provides a solution. The judging panel is a multidisciplinary group of lecturers and professional staff from across the university, who will judge submissions based on the questions below. Does the work clearly identify an environmental issue and its importance? Your submission should clearly state what environmental issue is being discussed and addressed throughout the piece of work. What methods or approaches are used to investigate the identified issue? Your submission should outline the method or approach used in your work and why it was chosen. What were the key findings from your piece of work, and what solution or recommendations have been made? Your submission should outline the key findings from your work and highlight how this has been taken forward to inform a solution or recommendation. How appropriate and feasible is the solution in reducing environmental impacts? Outline how environmental impact will be reduced and to what extent.High scores will be awarded to work that identifies an appropriate and realistic solution to the issue identified. High scores will not necessarily be awarded to complex solutions, if they are not appropriate and feasible. How innovative is the project in comparison to the current solution(s) in the industry? Higher scores will be awarded to work that identifies an innovative and appropriate solution to the issue identified. High scores will not necessarily be awarded to complex solutions, if they are not appropriate and feasible. Submissions should also outline how environmental impact will be reduced and to what extent. How can the work, or solution, be developed further and create a lasting impact? How will your work inspire change and action? Your submission should address how the work could be further developed and the impact that this could have on reducing the environmental impact of the issue identified. To apply for the Environmental Award please complete the form here, answering the questions to meet the above criteria.